Please update us on the progress you have made on your MRR projects this week (commencing: 5th Oct 2018). 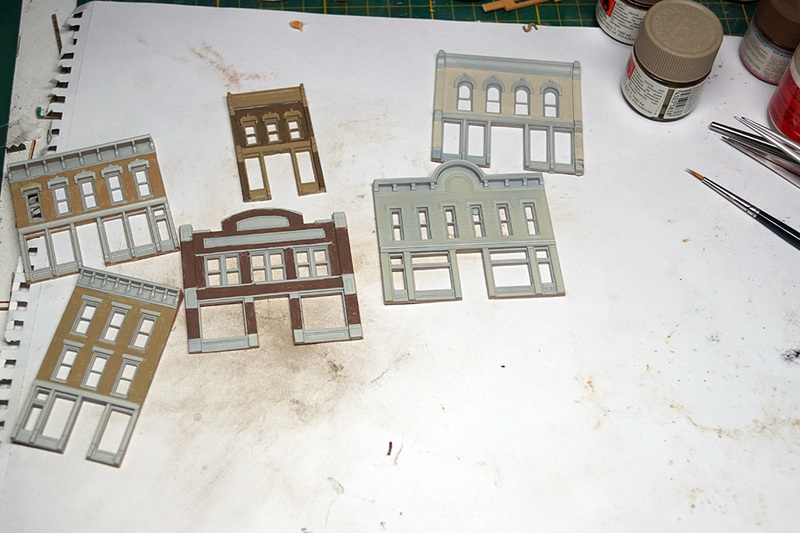 Besides working on a liftout and laying and soldering track , I also did some painting of DPM fronts for Belleville Main Street. I have a love-hate relationship with painting DPM buildings. I dread starting because of the fine brushwork around windows and trim, but feel very satisfied when done. I am the same as you - they can be a pain to paint BUT do look great when done, as yours prove. In the above picture they are primed and the bricks have been done , when that is fully dry I do the windows , doors , frames. Get a good fine brush , don't go cheap on this brush , you need a brush that is small but still holds enough paint without showing a blob of paint. One trick I stumbled across when painting my Heavy Weights was to paint the "windows and door frames" from the back. Granted I use an airbrush but found that the paint only covered what was inside the window or door and didn't get on the exterior. Will that work for a structure? I really don't know but can't see any reason why it wouldn't or couldn't. Damn Mark that looks good! Have you figured out what those yellow tubs are use for yet? 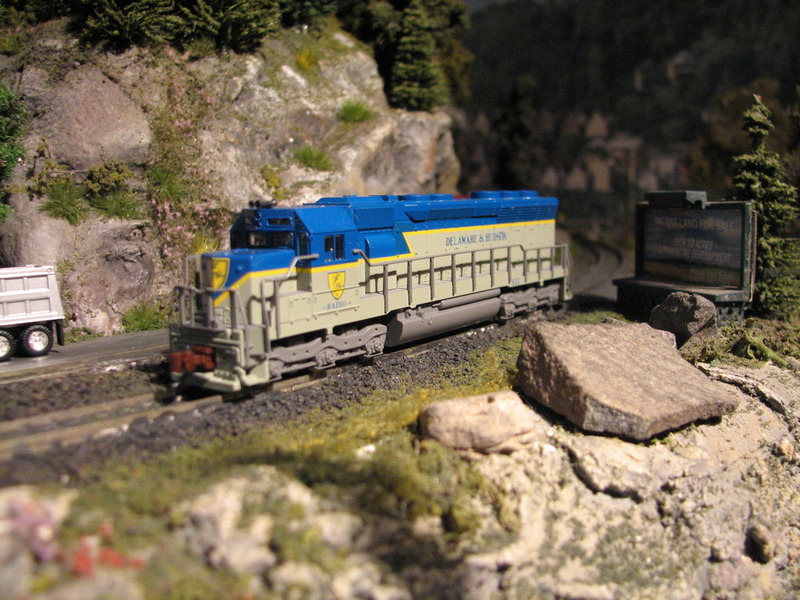 Cleaned and lubed a bunch of new-to-me locos... Really love these LL DL-109 units and this is my first LL RS-2 --really smooth & quiet -- as well as first Athearn FP45 unit -- very impressive (maybe the biggest flywheels I have ever seen on an N-scale loco). I also cleaned and lubed a couple of new-to-me European Steam Engines. The Green Arnold 4-6-4t loco is missing an eccentric pin in case anyone has one that might be compatible (it is also missing a step which I will try to replace but otherwise in great condition). I am a sucker for Tank Steam Engines. EDIT: This little 4-4-0 shows what a small steam engine can be (even quite a while back) -- every wheels provides pickup besides the right two pilot wheels... All-wheel tender pickup, pilot truck provides left pickup, all drivers powered (although two have traction tires). Last edited by Mac; 7th Oct 2018 at 02:15 PM. They look great Mac - top job! Finally picked up a Kato D&H SD45 off Ebay. 35.00 w/ Microtrains including shipping. Not quite new but close. Patience grasshopper patience. Well worth the wait! Are they "emergency water baths" for the filling crew in case of a leak? If it ain't pulling a caboose, it ain't a train. If I had to guess, I'd say that sounds about right. Could also be water for horses if somebody pulls in with a horsedrawn NH3 tank? Great farm supply , where is the baler from? And also who makes the poles with transformer? The power poles and transformer are Atlas. I cut the top two courses of arms off. For the transformer -- I take the transformers off of a pole - clean them up and glue them together. Have to find me some of those balers, thanks. Moose hook-up Digitrax LNWI (wifi for loconet) and run some trains a few laps around the layout ... Yeah!